The foodservice industry is always evolving, which can make it difficult to stay on top of market changes like restaurant openings, closings, or ownership changes. In fact, about 10% of the restaurant market is subject to change each year. With so many meaningful changes taking place, it can be difficult for foodservice manufacturers and distributors to stay on top of industry statistics and intelligence. Thankfully there is something operators can use to supercharge their marketing strategies: Data. Industry research shows that data degrades at a rate of 2.1% per month or 25% each year. This coupled with the fluctuating nature of the foodservice industry makes it difficult for foodservice industry professionals to truly leverage their internal customer data, which leads to ineffective marketing campaigns and an inability to calculate market penetration or target prospects. On the other hand, savvy operators use comprehensive and accurate data to drive their sales and marketing strategies. While inaccurate data can harm programs, accurate foodservice data allows businesses to grow sales revenue, improve operational efficiencies, and generate greater profitability. Collecting and utilizing this data can feel like a daunting task for operators to take on, especially when added to their already long To-Do lists. CHD Expert’s solves this problem with our Easy2FIND™ Database. Our data is powered by Easy2FIND, a web-based search platform that provides market intelligence and foodservice data to foodservice providers of all sizes around the world. CHD Expert does this by meticulously collecting, analyzing, segmenting and managing millions of data records. This provides our clients with the most detailed information available. Monthly updates to the database ensure that our data reflects the most recent changes in location opens, closes, and ownership. 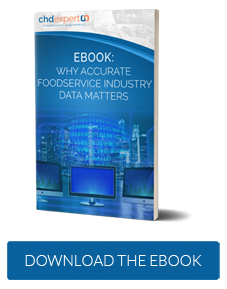 Accurate foodservice data makes it possible for operators to better understand the needs of customers and gives them the tools they need to uncover key business information. Data enables operators to offer the right product to the right customer at the right time. In addition, accurate data helps sales and marketing teams to turn their internal customer databases into actionable assets. The use of complete, up-to-date, and comprehensive data leads to more enterprise opportunities, smarter business decisions and greater lead generation. At CHD Expert we have all kinds of foodservice data and our database has over 40+ filters you can use to segment data. CHD Expert is home to the latest and most comprehensive data in the foodservice industry, and with access to our Easy2FIND database you will have all the information you need right at your fingertips.